Mike drove us up to WWLP's transmitter site (which is also the former location of their studios) on Provin Mountain in Agawam. From the back side of the building we can look up and see a whole bunch of towers, but two obviously stand out. The stubby one on the left is the original channel 22 tower, dating back to when WWLP first moved from channel 61. 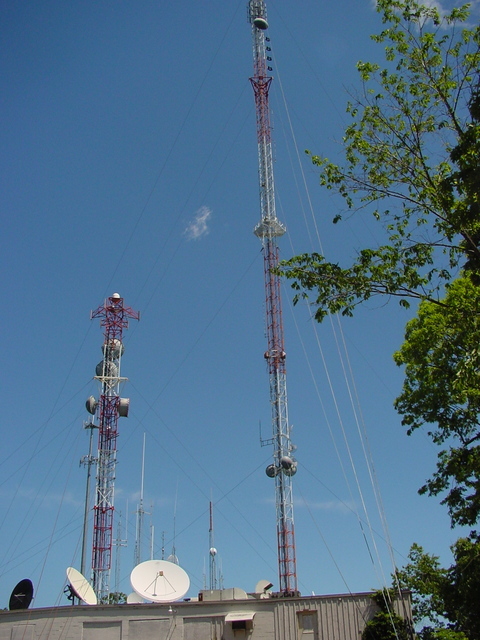 The one on the right is the current home of WWLP, its digital signal on channel 11, WAQY (102.1 Springfield) and WPKX (97.9 Enfield).